If you see a warning message “This site may harm your computer” in Google search results under your web site, the situation is really bad. You need to react immediately to remove the label from Google or else within few days your business will get affected badly without any traffic to your web site. Why Google labeled your web site as bad? The reason may be when GoogleBot last visited your web site found some of your web pages infected by malicious code. You must check all your webpage’s for any malicious code and remove it. You must read my other article Firefox Reported Attack Site on removing malicious codes and securing your website. Before doing this you must make sure that your web pages are clean and no longer host any malware. 1) Log in to Google Webmaster Tools www.google.com/webmasters/tools/ 2) Add your website to webmaster tool and verify your website by adding a Meta tag to your index page. 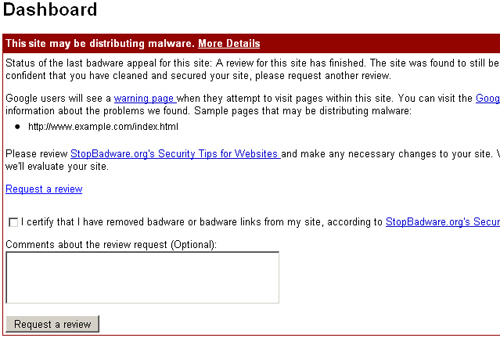 3) Now you see your website is verified and Sample pages that may be distributing malware will be listed. 4) Again verify the listed pages are clean and Place a Request to remove the label. 5) From our experience the label will be removed within few hours; so, sit back and relax. 6) If the label is not removed for more than 24hrs you need to check Google webmaster dashboard for the reason. Possibly one of your pages is still infected so clean it and place a request again. After Google removed “This site may harm your computer” label from your website it doesn’t mean that it won’t happen again so take some preventive measure like: 1) Checking your web site regularly for the next few days to make sure the pages are intact. 2) Check your access logs for anonymous activities. 3) Change your FTP and Control Panel Passwords time to time. 4) Make sure your Antivirus and Anti-Spywares are up-to-date. 5) Always use legitimate software’s. techgist tips: Updating our knowledge time to time on the spyware and malware threats and updating the software to solve the threats alone will save us from facing this problem. Be aware of the hackers.